A good morning routine doesn’t guarantee a good day, but it sure makes it more likely! I know there are elaborate morning routines out there, and for anyone who successfully manages a complicated sequence of morning tasks: you don’t need to read this. No need to fix what isn’t broken. Mornings aren’t my favorite. I’m a night owl. Well, night owl is one way to put it, insomniac might be another. Night time is when I find my groove and I don’t have a natural shut off. Morning time usually starts with being mad at my night time self! I’ve learned to work with my natural tendency as a night-time person. I setup as much as I can the night before. I plan the next day, have my purse packed and ready for wherever we might be going, and have the house in order for the morning. When I’m working with one of my organizing clients and learn that they are a morning person instead of a night owl, we adjust the night and morning routines to cater to their strengths. And you should adjust too! The most important thing you can do for your mornings, especially if you are trying to climb out of a rut, is to decide the first three things you will do when you wake up. Go to bed rehearsing them in your mind and wake up ready to knock them out. Choose three things that will set the direction of your day, don’t just check boxes out of obligation. Choose three things that you will be grateful you did all day. 1. Get myself dressed for the day. If I start my day with these three things, I’m in the right place mentally to get to the laundry and feeding everyone breakfast and doing lots of little girl hair. 1) I set out my workout clothes for myself near my bed so I can roll out of bed and put it on. 2) I keep up with the laundry and make sure laundry is put away the night before, so I don’t have to scrounge for clothes when I’m getting dressed. If the next day requires an outfit out of the ordinary, I select that outfit the night before and hang on a hook in my closet. 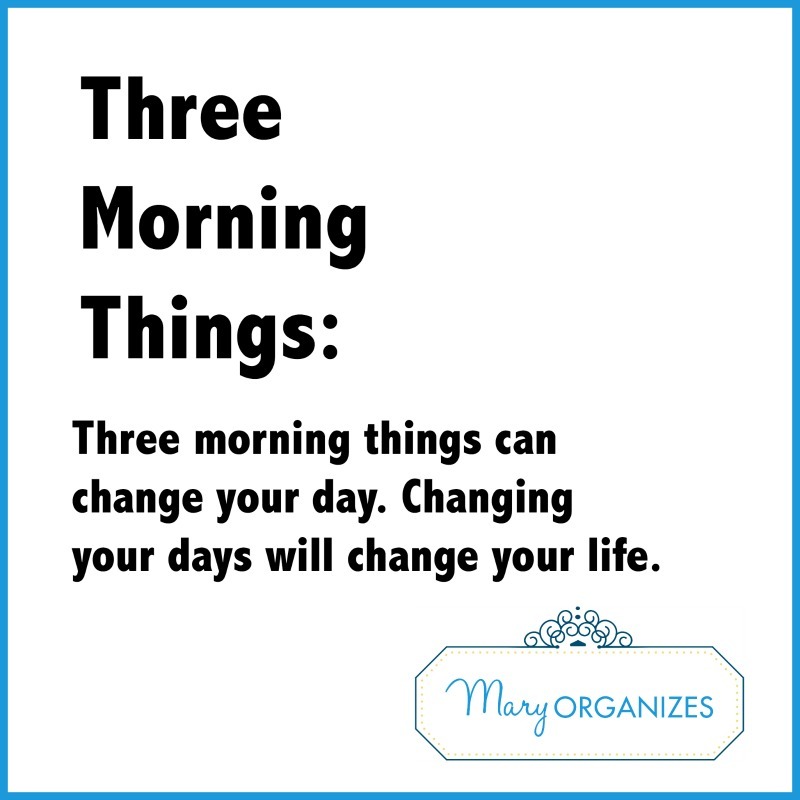 Three morning things can change your day. Enough changed days can change your life. Those are my three things, now I want to know yours! 1. Throw in a load of laundry. This is easy since my laundry is on the second floor of my house. 2. Check my work and home calendar for the day. 3. Get myself showered and dressed for the day. I really need to incorporate exercise but right now my three things are 1. shower to wake up 2. Coffee (and breakfast sometimes) 3. Quiet time and devotional emails. Wonderful encouraging way to start the day..,. Especially the work out!!! Thank you! On mornings that I don’t workout, I try to at least stretch a little to wake up my muscles. It does a world of good! I play French horn as my profession so a morning warm-up is definitely one of my three things! Slowly we’ve been working on expanding morning and night routines for myself and my family. Just a little bit at a time but we’re making progress and with that progress comes a relaxation and dispersal of stress as everything begins to fit together nicely. Isn’t it amazing how improving something like a personal routine can really dispense with so much stress?! I love your three things! Thank you. I don’t function in the morning. It’s nice to hear it’s possible to be organized and keep the morning routine simple. Pray; email; work out. It used to be: pray, workout, email, and I was thinner then, but the internet has gotten in my way!! Thanks for this post, Mary. I am going to switch back to pray, workout, email!! The internet is such a temptation first thing! I do so much better when I set my day’s direction without Facebook getting in the way.